Ball Screen and Roll Shooting – A teaching and shooting drill to introduce wing ball screen progressions. 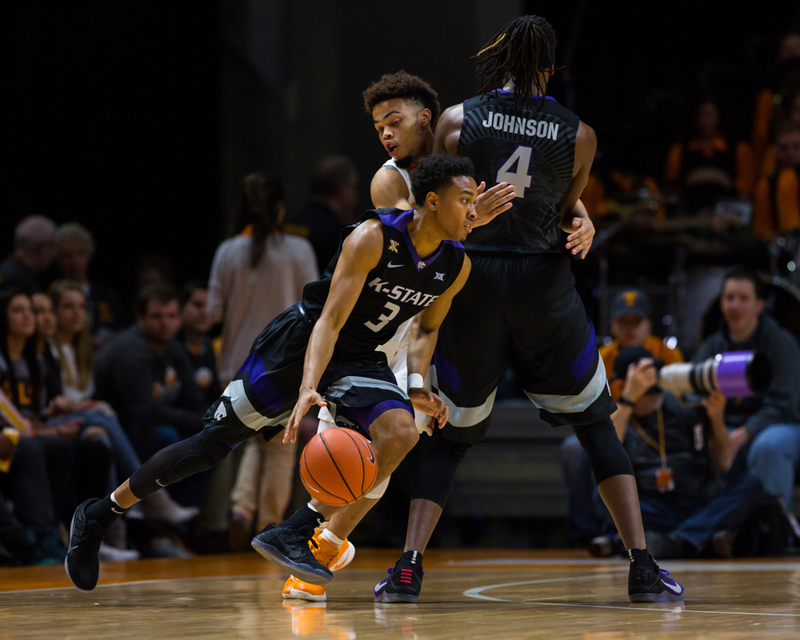 The wing ball screen is a common way to create an advantage for the ball handler, the roll man or a third player. 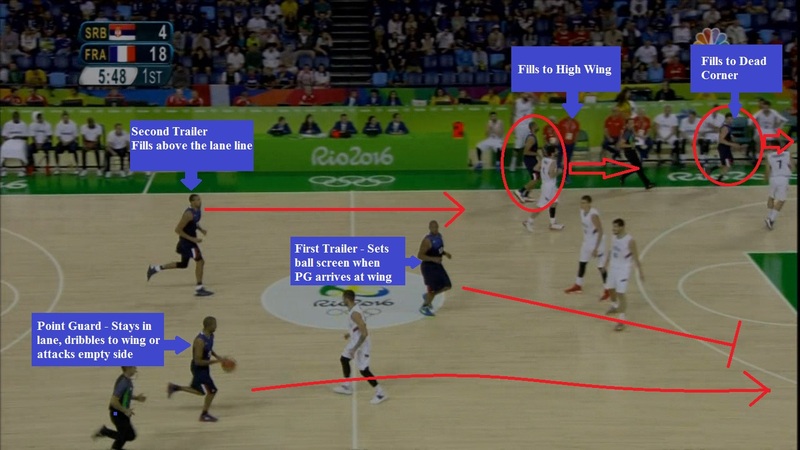 Increasingly, teams are running the wing ball screen directly from transition offense with an empty corner (see photo diagram below of France from Rio Olympics 2016). Creating a ball screen based shooting drill and advancing through the progressions can be an effective way to introduce this concept. The following drill sequence takes players through several options on wing ball screens and delivers shots off of each one of the ball screen options. 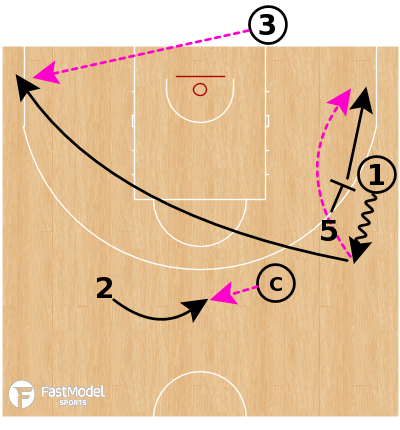 The following drill is a Phase A teaching drill where a skill or concept, in this instance the ball screen, is being introduced. Phase A drills are done “on air” and will be advanced as skill and knowledge are acquired. Players 1, 5 and 2 all have a basketball, the coach/manager/passer does not. Player 1 begins on wing. Player 5 (a forward or center) begins just above Player 1. Player 2 sets up just outside the opposite lane line extended. The passer/coach is just outside the right lane line extended. All options are taught from this same setup. In this order, Player 1 initiates the drill by passing to Player 3. Player 5 then passes to Player 1 and follows into the side ball screen. Player 2 passes to coach. From here the players progress through different options. 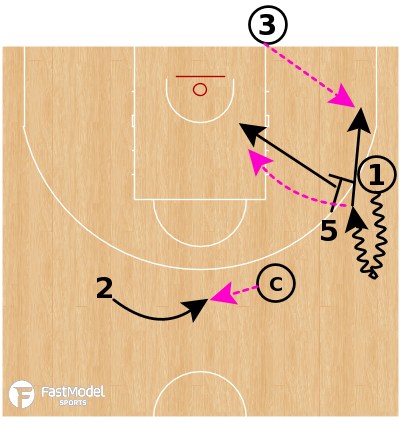 Advancement: Start Players 1, 2 and 5 at the halfcourt line above their spots and have them dribble into the drill from there to somewhat simulate flowing into the wing ball screen from the break such as France does above. All phases of this drill begin with the same setup and passing sequence described above. In the first phase, the guard (Player 1) accepts the screen and scores at the rim. Player 3 hits Player 5 rolling out of the ball screen. Coach hits Player 2 on the loop for a shot. Coach may take a forward dribble towards the nail and rugby toss to the Player 2 looping behind. All players get shots. Guards can rotate through their spots in the drill and new post players can be rotated into the drill. Another option when accepting the ball screen to drill is the ball handler “finding a pocket” and taking the pull up jumper in the lane. Begin this phase of the drill in the same setup and passing sequence. Player 1 finds a pocket of space in the three second area and pulls up for the shot. In lieu of taking the ball into the rim protection, a pocket of space in the paint is found. 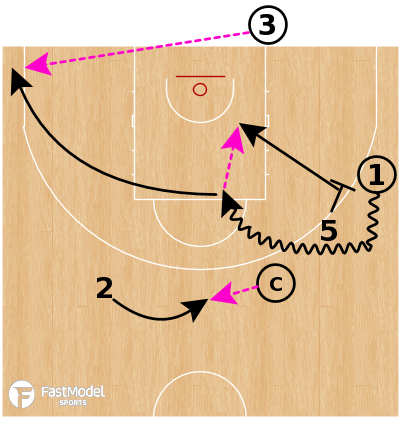 Player 3 hits Player 5 rolling out of the ball screen and coach hits Player 2 on the loop. Another option is to reject the screen and attack baseline. This drill can address the reject as well. Begin from the same setup and passing sequence. The ball handler rejects and drives baseline. Player 5 cuts into the “taillights” of Player 1 and receives pass from Player 3. Player 2 gets the loop from coach. Advancement: Player 1 rejects, jumpstops, pivots and throws to Player 5 in his/her taillights for a shot. Player 1 would then split the defense and sprint to opposite corner and get a pass from Player 3. Against a hard hedging defense, the slip and split are options. 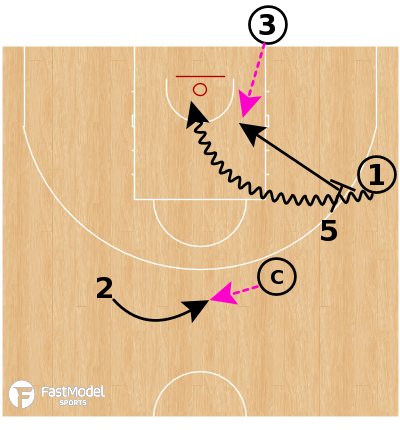 The screener slips out of the ball screen and the ball handler retreat dribbles pulling the hedging defender away then crosses over and splitting the hedge. The sequence begins with the same setup and passing order. Player 3 hits Player 5 slipping to the rim for a layup. Player 1 retreats, crosses over then attacks either for the layup in a pocket or to the rim for the score. 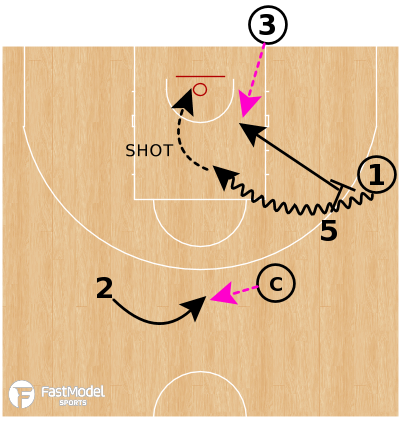 Player 2 cuts behind coach for the shot off the loop. Check out this drill in the video below! The next option is for the ball handler to hit the roll man (Player 5) then split the defense. After the setup and passing sequence, Player 1 uses the ball screen and finds Player 5 rolling to the rim. Player 5 gets the layup. Player 1 splits the defense by running to the corner for the drift pass from Player 3. Player 2 loops behind coach for the shot. Some defenses elect to neutralize the advantages created by the ball screen by switching. This phase of the drill introduces the counter to the switch. 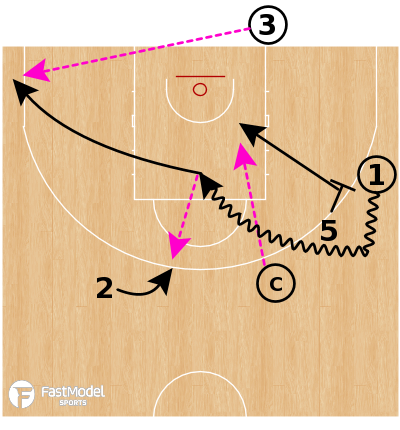 After the setup and passing sequence, Player 1 accepts the ball screen, stretches the switch, pivots back and feeds Player 5 in the post. Player 5 would bury his/her defender in the low block area. Player 1 relocates and gets pass from Player 3. Player 2 cuts behind coach for the pass to the loop. Advancement: Double down, kick out. After feeding Player 5 in the post, Player 1 relocates. Player 5 passes out to Player 1 for the shot. Player 3 hits Player 5 on the re-post. To disrupt the offense and put the ball in a disadvantage situation, defenses can trap ball screens. The next phase of the drill can introduce the reaction to the trap coverage. After the setup and passing sequence, Player 1 drags the trap away and Player 5 sprints to space in the corner. Player 1 finds Player 5 sprinting to space for the shot. After passing, Player 1 splits the defense to the far corner where Player 3 passes to them for the shot. Player 2 cuts behind coach for the pass to the loop. The ball handler using the small advantage created by the wing ball screen may draw help from the nail defender. The next phase of the drill reps the drive and kick which transfers the advantage to Player 2. 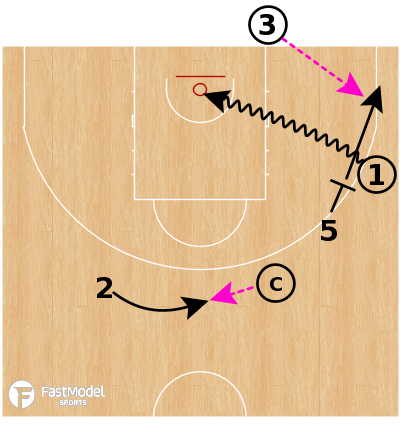 After the setup and passing sequence, Player 1 accepts the ball screen, gets a piece of the paint then kicks to Player 2 on the loop behind the drive. Player 2 catches to shoot on the one count. Player 5 rolls and coach makes the pass to him/her. After kicking to Player 2, Player 1 splits the defense to the far corner for the drift pass from Player 3. In Phase A drills, like the one described in this blog, emphasize technique and fundamentals. With no defensive interference the focus is on initiating the teaching and acquisition of the technique. In this drill, players have not learned how to make ball screen reads. They are simply introduced to options with appropriate technique. Advancing the drill to Phase B would include the introduction of a decision-making element. Adding a guided defender who executes a hard hedge or shows chest help on a drive adds to the if/then decision making of ball screen reads. Taking the drill to Phase C would entail going live against a defense. Guard Players 1, 5 and 2 and have the defense execute some of the ball screen defensive tactics. Give the same offensive group multiple reps against different defensive coverages. Can the offense recognize and react properly? In Phase D apply the skill in a game-like situation. Perhaps begin a game of 3-on-3 with this sequence. Start a 5-on-5 offensive possession with this side ball screen scenario. Mastery happens with a player can apply these decisions in a game-like scenario without much thought. This introductory teaching and shooting drill begins the process of teaching ball screen reads through this pathway. Please share other options that can be blended into this drill and your ideas for advancing the drill through these phases in the comments section below. Special thanks to Coaches Eric Fierro [Head Boys Basketball Coach, Southern Regional (NJ) High School] and Billy Armstrong [Head Boys Basketball Coach, Bergen Catholic (NJ) High School] for providing video footage.